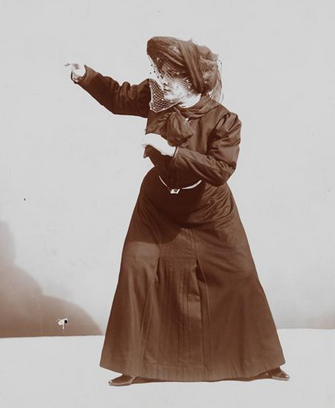 A 1911 self-defense article for women and a mysterious death. It does appear that a part of this method was indeed published; most interestingly it was exactly two months after the mysterious death of Dr. Latson. 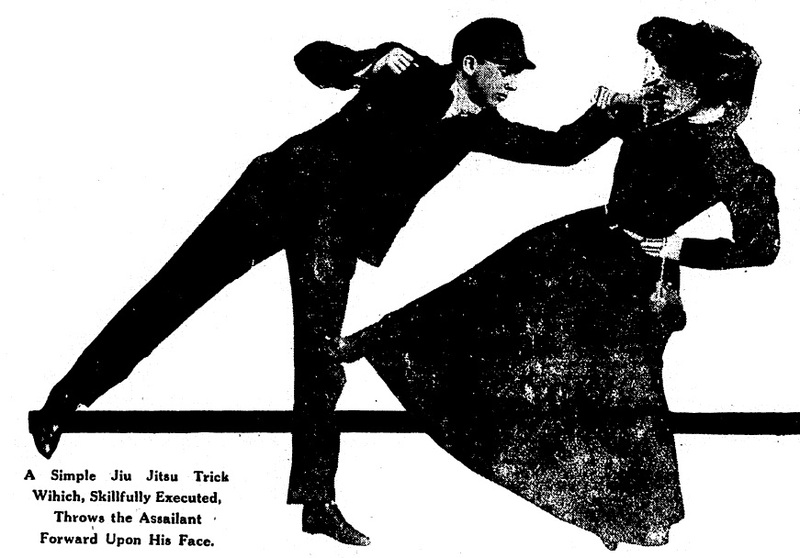 It is not impossible that Ms. Rosenthal chose to publish (in several newspapers) some of the notes from her former lover’s method and thankfully we are now able to learn more about this method which seems to combine jiu-jitsu, calisthenics and possibly some variant of Irish stick. I have included in this transcription some of the unpublished photographs but which do seem to describe parts of the techniques involved. The text and pictures are taken out of the June 11th 1911 Denver Post. This is a statement made by women who have been fortunate enough to escape the many “perils of the road.” Unfortunately, however, everyone who is familiar with conditions in city streets knows that minding one’s “own business” is by no means a guarantee against insult from the irrepressible “Johnny” or more serious attack at the hands of thugs. This evil of the aggressive masher is a growing one. No attractive woman abroad unescorted is free from his sickening advances. In New York, Chicago, Boston, Philadelphia and other large cities conditions are perhaps worse than elsewhere, but in no city of the Union is the street “Johnny” unknown. The evil is too exclusive for the police to cope with. A careful study of the situation by experts has brought the conclusion that if women are to be protected they must protect themselves. 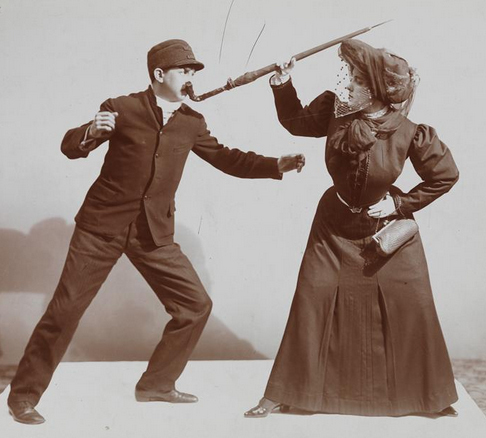 How is the “womanly art of self-defense” to be acquired? Various well-known physical instructors have been approached on the subject, and they have made a number of valuable suggestions. Some of the defensive measures are fully explained on this page. Others will be given in this paper from time to time. A few moment’s attention to this subject will disclose the fact that the art of self-defense is far less difficult than piano playing, fancy work, small talk, letter writing, or any of those accomplishments upon which the young women of the day spend so much time and thought. To learn how to protect one’s self against the man who tries to grasp one’s watch or put his arms around one or to confine one’s arms, is merely a matter of a few weeks’ practise. Any young woman of fair average physical powers can. In a few weeks, acquire such mastery of the art of self-defense that she will be quite secure in from any ordinary attack. It is, perhaps, unnecessary to state that no woman can become proficient in the art of self-defense unless she is in at least fair general health and of average muscular strength. It is equally essential that she should have a clear head and a strong will. Any woman who possesses these things, however, can in a short time learn to become so formidable a foe as to be more than the equal of the average “masher” or footpad. The first requirement in the art of self-defense is to learn how to stand. In this matter, as in so many other accomplishments, the position of the body is of fundamental importance. Stand with weight upon left foot, toes pointing straight in front of you. Extend right foot about fifteen inches toward the right. Throw left arm behind the body, the back of the hand resting against the hip just below the waist. Turn face toward the right in the direction in which the right foot is extended, throw out the arm in the same direction. In the right hand you should have an umbrella or a light walking stick which should be held so that the ferrule end point straight upward. Standing in this position, swing the weight easily back and forth so that it is balanced between the feet: After a little practice in moving back and forth in this way, swing the body on a pivot from side to side, sweeping the stick in a semi-circle in front of you. These two movements should be practiced until the weight is borne easily, lightly and rapidly in both directions. 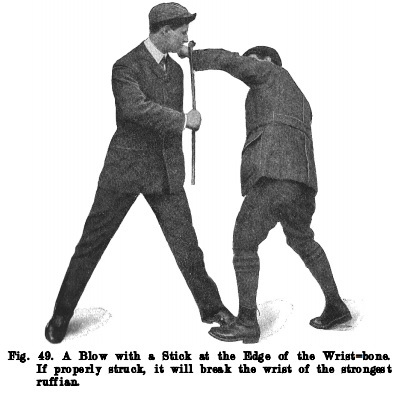 To guard against a blow from the fist or hand the stick or umbrella should be swung in front of the arm as it moves to the attack. 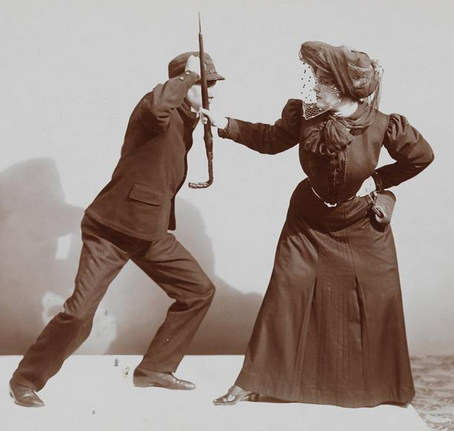 If the footpad or masher should grasp the woman by her arm or shoulder nothing is easier than for her to drop back into position, raising the umbrella and thrusting the handle end full in the face. One or two prods of this kind will cool the ardor of the most amorous footpad. 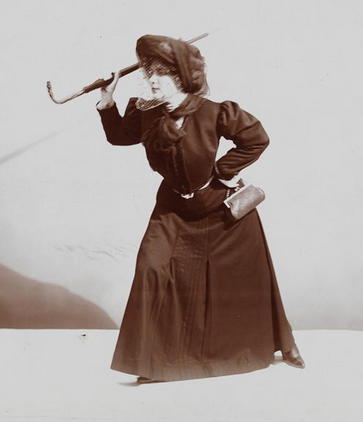 The girl who would master the art of self-defense should also practice holding the umbrella by about its middle out of arm’s length and moving it easily up and down straight out toward the right while standing in position. This makes perfect protection for a downward blow from either the arm, club or slungshot. As the blow is made the umbrella held in a horizontal position, should be swung easily to meet it. From this position, it is a very simple matter to swing the defending umbrella around so as to give either a prod in the face or a blow which is likely to prove the quietus. To fully master the interesting, powerful, nay, even terrible, system of attack and defense known as the “jiu-jitsu” or jiudu” requires many years of study and practise. The advanced attacks are taught only to specially trained and qualified students. There are however, a few simpler tricks which any one with a little skill and some self-control can master, and which used at the proper time cannot possibly be resisted by the person unacquainted with the system. The two following tricks may be applied by any one, no matter how slight of strength, if she but have the skill and self-control to do them. The skill may be acquired by practise; the self-control is also largely a matter of training-but that is another story. The first trick is somewhat in the nature of a kick, and therefore all exercises dealing with training for the legs will be most helpful in acquiring this manoeuvre. As the attacking party advances he will, in nine cases out of ten, stand with the right foot in front and make the attack either by a blow or a grasp with the corresponding hand. The trick is simply this: as the opponent extends his right hand the defending party grasps the wrist with her own right or left hand. At the same time she extends her foot, and with straightened leg presses the right knee of the man attacking her, while she pulls sharply towards her on the wrist which she grasps. The inevitable result of such a manoeuvre is to throw the attacking person forward upon his face. If this defense be made skillfully the result cannot fall to be a nasty fall for the attacking individual. 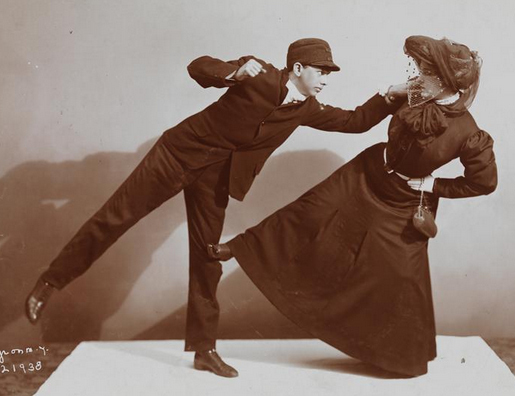 Should the attack be made with the left foot forward and left hand advanced to grasp or strike the defending person, the action on her part would be exactly the same, save that, of course, her foot must be pressed against the leg in advance at the knee, while at the same moment the hand is pulled forward. In case, as will occasionally happen, the footpad should have the left foot in advance and make the attack with the right arm, the tactics of the defender would be exactly the same, save that it would be more effective in such a case if the sharp pull were made in the direction of the attacking party’s advanced leg. In the second trick it is supposed that the attacking party advances with the right foot and right arm exrended either to grasp at or strike the defendant. In order to best execute this trick the defendant will drop back into position described in the earlier exercises in this article-left foot behind, right foot and right arm advanced. She will then grasp with either one or both hands the hand and wrist of the attacker, taking one step forward so that her right foot is behind his right and twist his hand upward and backward. 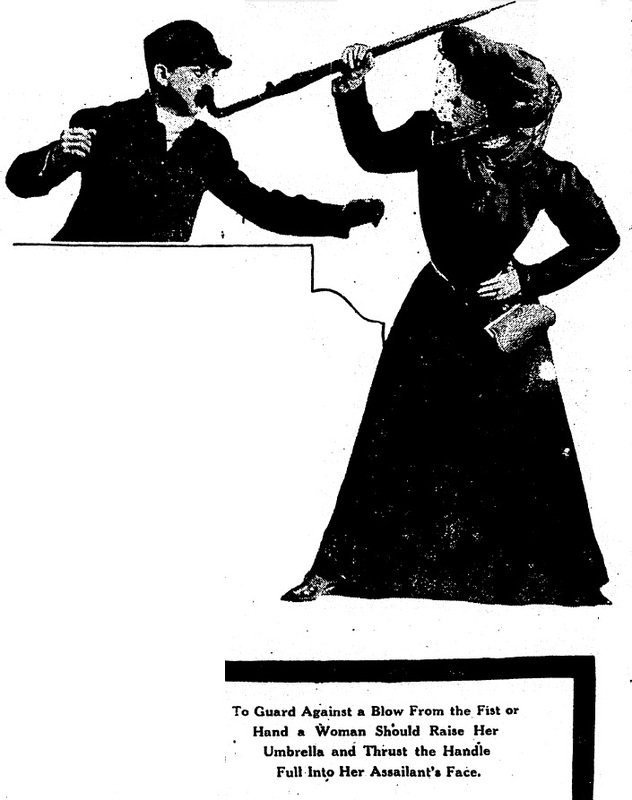 If she has succeeded in clutching the hand quickly and firmly, and if the movement on her part is made with sufficient rapidity, a man, unless highly trained in jiu-jitsu, will be utterly unable to resist either being thrown backward upon his head or sustaining a nasty fracture of the forearm. There is a defense, and a beautiful one, for this trick, but it will be known only to an expert jiu-jitsu man. In practicing these two simple tricks upon a living model much care must be used. The movements should be gone through very gently and slowly, and at the first intimation that the other party is trained or feels the slightest discomfort the movement should be stopped. Otherwise a broken forearm, a broken leg or a smashed face will be the results. In case of attack upon the street, it is needless to say that such caution would be quite out of place.